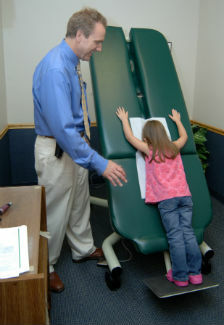 Dr. Bennett was in his teens when he experienced a chiropractic adjustment using the Activator® instrument. He immediately felt a difference compared to manual chiropractic techniques and knew that he would become specialized in Activator Methods®. The Activator® is a highly fine-tuned, FDA-approved instrument. It is more accurate than traditional chiropractic adjustments and can adjust any part of your body safely, in any direction. A special table is used to give you comfortable, effective adjustments. The Activator Method® analyzes your needs by using a series of leg balance testing reflexes. This system looks at each joint in your spine or extremities against the balance of your leg. The test will tell Dr. Bennett where to adjust, where not to adjust and when to stop. When it comes to your health, experience matters. Dr. Bennett has been using the Activator® Methods technique for over 30 years and is even an associate clinical instructor in Activator Methods® seminars around the Midwest. You can learn more about Dr. Bennett and his experience with the Activator® on the Activator Methods® website. We’re not chasing symptoms, but instead focusing on the underlying condition that’s causing your problems. Contact our office today to schedule an appointment!